Do you want to explore the world of chocolate in more detail? Dying to get more information about cocoa? And are you curious how our chocolates create sensational new flavours with other products? Then please look beneath for our tastings and pairings. Beer and Chocolate Culicombination – Beer and Chocolate? Is that possible? Well, it is even a match made in heaven… Just get ready for a whole new experience with all our different chocolates. Venue: Wherever you want! Date and Time: That’s up to you as well. More information: Website of “De Bierverteller” or contact Astrid, Joeri and Chaim (bierboetiek@debierverteller.nl). Wine… Whiskey… Mesjokke! 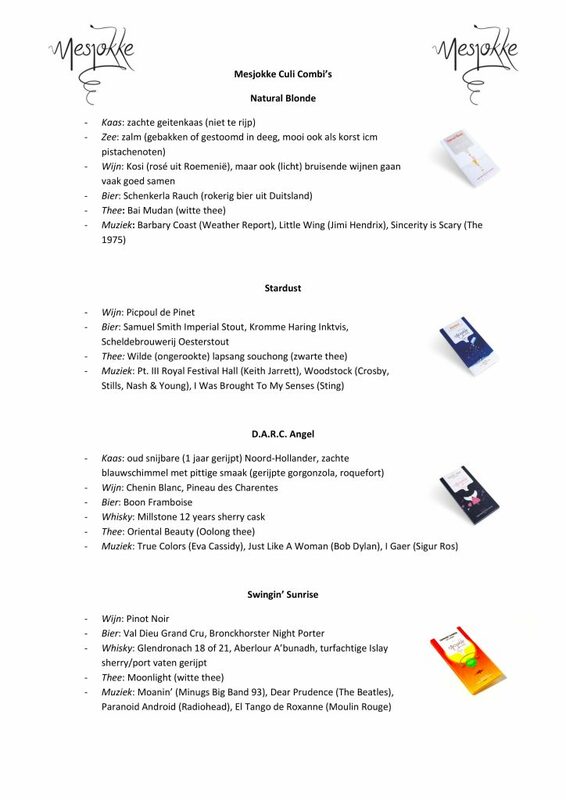 – A combination of Mesjokke-chocolate with the most beautiful wines and whiskeys cannot be left out in this list. And now you can even create your own pairing, according to your wishes! And if you don’t want to be creative at all, that’s no problem at all… Mesjokke is used as well in all the whiskey-tastings that are already planned by the liquor store. Venue: Kwestie van Smaak, Briljantlaan 5, Utrecht (or if you wish, at any other location…). Date and Time: There is a diverse range of tasting planned (please check the programme!). If this does not suit you, you can always organise your own tasting. More information: Website of “Kwestie van Smaak”, or contact Alex van der Linden (info@kwestievansmaak.nl; 06-28228390). Choco-cruise – Cruising on the channels of Utrecht, enjoying the view, feeling the sun shine on your head… Can it become even better? Yes it can! Get on board of the chocolateship, and get to know everything of cocoa, chocolate and the whole production as well. And needless to say, you will taste all our chocolates as well. Venue: There are different places of departure in Utrecht. Date and Time: Whenever you want; it will take approximately 1,5 hours. More information: Website of Lekkerbootjevaren, or contact them (mail@lekkerbootjevaren.nl; 085-7325736).